Perverse incentives woven into the fabric of systems have the tendency to undermine positive outcomes and exacerbate abuses of the most well-intentioned programs. 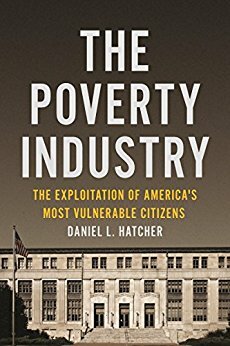 In his 2016 book, The Poverty Industry: The Exploitation of America’s Most Vulnerable Citizens, Daniel L. Hatcher, a law professor, exposes the manifold perverse incentives of our various contemporary aid systems. From the start, it should be clear that Hatcher is not an angry Republican bemoaning money wasted on the bottom end of the social scale. In fact, the book is published by New York University Press, which is not known for being a bastion of conservativism. Also, Hatcher especially highlights as many as Republicans who are abusing the intent of various Federal aid programs, while being much less intrusive and accusatory toward Democrats. Toward the end of the volume, he makes it clear that he is not calling for an end to the Federal programs or a reduction in their expenditures, but rather a deeper look at abuses that prevent the programs from achieving their ends. There are several examples, but Hatcher spends a great deal of time walking through abuses that are endemic in the child protection systems. In an attempt to recoup funds, these government departments often confiscate property from their wards, seek ways to maximize streams of income from the Federal government, and fail to use the resultant funds for the benefit of the children. It becomes advantageous, given the current arrangement, for agents to terminate parental rights from poorer kids, refuse to place them, and lengthen adoption processes because the lower the income the child’s parents have, the larger the aid income stream the state can harvest. Similarly, Hatcher highlights Medicaid programs in which states transfer large sums of money to hospitals to garner matching grants from the Federal government. The state “expenditures” are then funneled back into state coffers via bed taxes or ledger transfers. This means that the state actually does not spend the money that the Federal government was intended to match. It also means that the intended recipients of the redistribution—the poor—do not receive the intended benefit. Clearly, Hatcher is highlighting abuses, which may be representative, but likely are not normative. Much of the social work done by agents of the state is heartbreaking and hard, so we should not read his book in a condemnatory manner. However, there are fundamental systemic flaws and, more significantly, failures of virtue in the people overseeing the systems. The vast majority of the abuses Hatcher cites are, in fact, legal. If a hospital is owned by the government, then a ledger transfer is a legitimate means for it to transfer excess funds back to the parent government. However, when such transfers are examples of playing shell games with money, since money is fungible, then it undermines the sense of fair play and incentivizes everyone to misuse the system. Some of the systemic failures Hatcher highlights can be remedied by law. For example, the practice of the state receiving child support on behalf of its wards and then attempting to collect debts from often poverty-stricken “dead beat dads” can lead to the permanent estrangement of fathers from their children and warrants for the arrest of men and women who simply cannot pay the demanded support. This is, in one sense, the criminalization of poverty, which may lead to parents in arrears on their support payments fleeing from officers and, perhaps, being shot repeatedly in the back. Welfare is an indication of a failure of our economic system, so at some point, the law should simply recognize that much of that money is sunk and stop trying to claw it back from the poor. The greater problem, however, is an absence of virtue in society. (This is my conclusion, not Hatchers.) When legislators, governors, and administrators do legal, but unintended things to maximize their take from the Federal government it represents a failure of virtue. Economists and politicians can debate the relative merits of various social programs, but people should have the integrity not to attempt to game the system. Or, at least, if they do choose to milk the system for every advantage, they should pass those advantages on to the targeted recipient. Unfortunately, there is a too broad acceptance of the equivalence of legality with morality, which is intellectually sloppy and spiritually damaging. Hatcher’s book is an important one for understanding some of the reasons the so-called war on poverty has been so ineffective. The problem of poverty is not going away, and it may be that systemic flaws and a lack of virtue are contributing as much as the oft-cited lack of funding.